The Furian Knives. Influenced by Chronicles of Riddick. Made by Scorpion Swords & Knives from Quality Heat Treated Steel. See Pictures, Prices, and Descriptions. 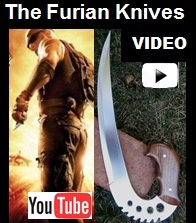 This blade is influenced from the ones Riddick used in the movie Chronicles of Riddick. A Furyan, named Riddick, had superhuman strength, speed, agility, reflexes, endurance/stamina, senses, healing, adaptation, and durability far superior to normal Furyans, even at infancy. He has a high level of abilities at hand-to-hand combat. A very tactical and methodical man, Riddick is able to quickly adapt to seemingly any situation or environment.